The C and DSE Telangana has given instruactions on Conduct of 'Prof. 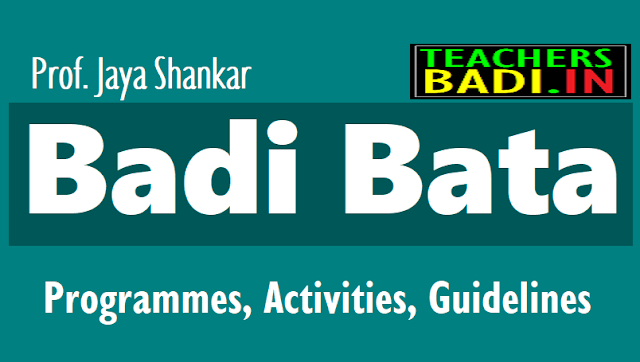 Jaya Shankar BadiBata' Programme for the year 2019-2020 in TS Schools. Below mentioned Preparatory Programmes(Activities) should be organized in the month of June 2019. Time to time detailed guidelines and instructions to be issued soon on TS schools Students Enrollment Drive, LEP 3Rs Remedial Teaching Porgramme, School Readiness - Class Readiness Porgramme, Badi Bata Schedule, Badi Bata Activities, Badi Bata Guidelines, Badi Bata Day wise Programmes, Badi Bata Programmes Day wise Activities. The day wise schedule and programme of BadiBata will be communicated separately. 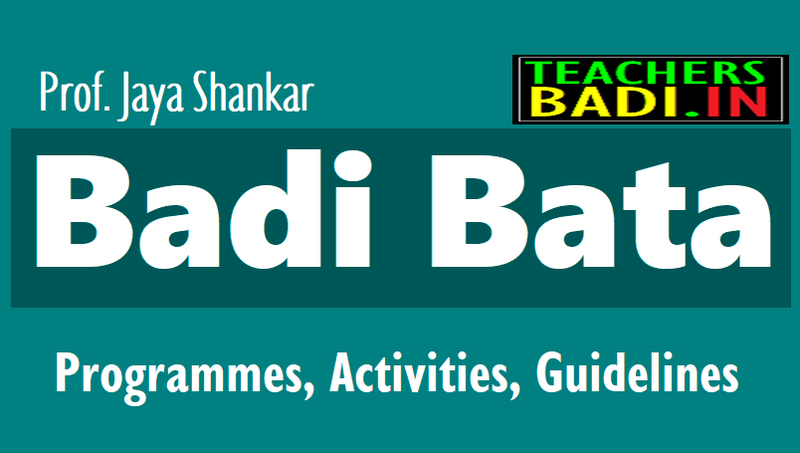 TS Schools Badi Bata Programme to be conducted during June 2019. The school teachers would conduct door- to- door campaign for the enrolment of students into the government sector, conduct mass Aksharabhyasam, distribution of books and highlight importance of government education. Enrolment of the Children -Professor Jayashankar Badibata 2018. Badi Bata’ to focus on enrolment in Govt schools . BadiBata Campaign: The school teachers would conduct door- to- door campaign for the enrollment of students into the government sector, conduct mass Aksharabhyasam, distribution of books and highlight importance of government education. a. Enrollment of all School age children into schools. b. Admission of OSC into Regular Schools. Every Headmaster of PS/UPS/HS shall prepare school profile., Total no.of school age children the catchment area number enrolled, no.of OSC performance of the children status of receiving of Free Uniforms, Free Text Books, Mid-Day Meals etc., and targets of the year2018-19. Every Student must write their profile i.e., family background, Aims and Goals, Strengths, Weakness, Opportunities and Threats support required etc., every school must prepare child profiels and keep them. 2018-2019: జూన్ 4 నుంచి 8 వరకు నిర్వహించనున్న ప్రొఫెసర్ జయశంకర్ బడిబాట కార్యక్రమ షెడ్యూల్‌ను పాఠశాల విద్యాశాఖ అడిషనల్ డైరెక్టర్ బుధవారం విడుదల చేశారు. ఐదురోజులపాటు నిర్వహించనున్న బడిబాట కార్యక్రమంలో ప్రభుత్వ పాఠశాలల గురించి గ్రామీణ ప్రాంతవాసులకు తెలియచేయడంతో పాటు ఇంటింటి ప్రచారం చేయాలన్నారు. ఇందులో ప్రధానోపాధ్యాయుడు, ఉపాధ్యాయులతోపాటు విద్యాశాఖ అధికారులు కూడా పాల్గొనాలని తెలిపారు. ప్రతిరోజూ ఉదయం 7 గంటల నుంచి 11 గంటల వరకు బడిబాట నిర్వహించాలని షెడ్యూల్‌ను ప్రకటించారు. -జూన్ 4వ తేదీన మన ఊరిబడి కార్యక్రమం నిర్వహిస్తారు. ఇందులోభాగంగా పాఠశాలలను ఆకర్షణీయంగా తీర్చిదిద్దాలి. గ్రామాల్లో బ్యానర్లతో ర్యాలీలు, తల్లిదండ్రులతో సమావేశాలు నిర్వహించాలి. ప్రభుత్వ పాఠశాలల గురించి వారికి వివరించడంతోపాటు, నాణ్యమైన విద్యను పెంపొందించడానికి తీర్మానాలు చేయాలి. - జూన్ 5వ తేదీన బాలికల విద్యపై దృష్టిసారించాలి. వారికి మార్షల్ ఆర్ట్స్, జీవన నైపుణ్యాల వంటివాటిపై శిక్షణ ఇవ్వాలి. బాలికల విద్య ప్రాధాన్యం తెలియజేసేలా మహిళా అధికారులతో ఉపన్యాసాలు ఇప్పించాలి. -జూన్ 6వ తేదీన సామూహిక అక్షరాభ్యాసాలు నిర్వహించాలి. ఈ కార్యక్రమంలో స్థానిక ప్రజాప్రతినిధులను భాగస్వామ్యం చేయాలి. ఉన్నత పాఠశాలల్లో నూతనంగా చేరిన విద్యార్థుల తల్లిదండ్రులతో సమావేశం నిర్వహించాలి. - జూన్ 7వ తేదీన స్వచ్ఛపాఠశాల /హరితహారం నిర్వహించాలి. ప్రతి తరగతి గదిని పరిశుభ్రంగా తయారుచేయాలి. పాఠశాల ఆవరణాన్ని ఆకర్షణీయంగా తీర్చిదిద్దాలి. మరుగుదొడ్ల నిర్వహణ కోసం నీటి సదుపాయాన్ని కల్పించాలి. - జూన్ 8వ తేదీన బడి బయట ఉన్న పిల్లలను బడిలో చేర్చించాలి. పనికోసం వలసవచ్చినవారి పిల్లలను గుర్తించి సమీపంలోని పాఠశాలల్లో చేర్చేలా అవగాహన కల్పించాలి. మండల టాస్క్‌ఫోర్స్ కమిటీతో కలిసి బాలకార్మికులకు విముక్తి కల్పించి వారిని పాఠశాలల్లో చేర్పించాలి. Subject: TSSA Hyderabad- CMO wing- Activities - Conduct of Professor Jaya Shankar BadiBata Programme for the year 2018-19 from 04.06.2018 to 08.06.2018-Certain instructions issued -Reg. The attention of all the DEOs & Ex Officio District Project Officers in Samagra Shiksha Abhiyan the State are informed that it is decided to conduct Professor Jaya Shankar BadiBata Programme for the Academic Year 2018-19 from 04.06.2018 to 08.06.2018. In this context, the guidelines and the Day wise programme of BadiBata is enclosed herewith to conduct the activities and also Web Application (compatibility with mobile App) is developed in house to upload the day wise data of enrolment Mandal unit wise by the District users during the Badibata Programme. The website address is: 183.82.97.97:8010. They are requested to release an amount of Rs.1000/- (One thousand only) per school to all the Govt. and Local body schools in their Districts from the funds available with the DEO under Samagra Shiksha Abhiyan for preparation of pamphlets /posters on their School Achievements and facilities to enrol the children during the Professor Jaya Shankar BadiBata Programme. Therefore, all the DEOs & Ex Officio District Project Officers Samagra Shiksha Abhiyan in the State are instructed to conduct the Badibata programme with detailed plan of action as per schedule. The day wise data shall be uploaded in the above web address without fail. Badibata Guidelines and Badibata Day wise schedule details are given below..
C and DSE & Ex-Officio SPD SSA, Telangana, Proc.No.1056/ CMO/T8/SSA/2018 dt:15.03.2018. Subject: TSSA Hyd - CMO- Conduct of 'Prof. Jaya Shankar BadiBata' Programme for the year 2018-19 - Preparatory Programme- certain instructions Reg. All the District Educational Officers & Ex-DPO, SSA in the State are informed that it is proposed to conduct of 'Prof. Jaya Shankar BadiBata' Programme for the Academic year 2018-19. In this regard the following preparatory programmes shall be organized in the month of March / April 2018. Every Head Masters of Primary/Upper Primary Schools/High Schools shall prepare School profilei.e., total no.of School age children in the catchment area number enrolled, number of Out of School children, performance of the children status of receiving of Free Uniforms, Free Text books, Mid-Day Meals etc., andtargets for the year 2018-19. Badibata Programme after School reopening i.e., 04.06.2018 to 11.06.2018. Every student must write their profile i.e., Family background, Aims and Goals, Strengths,Weakness, Opportunities and Threats (SWOT) support required etc.,every School must prepare child profiles and keep them. Preparation ofSchool specific campaign material like phamplents, flexes on School performance and other highlights and Excellency in Academics. Updation of the Village Education Register (VER)with the coordination of SMCs/Teachers/CRPs/Anganwadi workers and same information should be updated in Child Info website as and when the application is enabled in online. Primary Schools: Prepare the list of School age Childrenin the catchment area (feeding strength) for enrolment in the Schools. i.e., Primary Schools shall prepare list of 5 years age children in the catchment area and also from Anganwadiesso as to enroll them in Class-I. All the Head Masters/ Teachers of Primary Schools shall interact with Anganwadi workers for enrolment of Children in their Schools. Upper Primary /High Schools: must collect list of class V children from the primary Schools class VII children in Upper Primary Schools in the catchment area for the enrolment in the high Schools, i.e., class VI & VIII respectively. The exact number of Out of School children i.e., never enrolled and dropout are not being reflected correctly. Therefore, the HMs of Primary, Upper Primary and High Schools shall prepare list of name wise all Out of School children in their catchment area i.e., never enrolled and dropouts. They should plan for their mainstreaming through Urban Residential Schools /Special Training Centres.ln respect of Drop out Girls the same may be forwarded to Special Offices of KGBV for admission. Identify the reasons for 'Zero/ less enrolment' Schools and prepare special plan for improving enrolment by involving local communities and Public representatives.The MEOs must plan with the concerned HMs. The HMs of Primary Schools, Upper Primary and High Schools shall prepare class wise list of children who can't read and write and perform fundamental operations of Athematic (3Rs). These children can be supported through summer Schools if possible during April & May 2018. The HMs of Primary Schools shall prepare the list of Outgoing children i.e., class V children and hand over to nearby High Schools / Upper Primary Schools for their 100% enrolment. Similarly the HMs of upper primary Schools shall prepare the list of class VII / VIII children and handover list to the HM of nearby High Schools and ensure 100% enrolment. The Head Masters/MEOs/SMC concerned must ensure for 100% transition from lower class to next higher class. All the Head MastersofKGBV/URS Special Officers shall set up an information and admission desk at their Schools in order to give admission to drop outs and monitor the entire admission process. All the HMs of High School shall prepare School Development Plan with clear cut programmes, targets and action plan to improve the Academic Performance of both Teachers and Students for the Academic Year 2018-19. Preparation of action Plan for door to door campaign by the Head Masters and Teachers for the enrolment of all Children in the catchment area. All the HMs have to meet the public representatives, SMC members, NGOs working for Schools and inform that about the Badi Bata programme, preparatory activities and invite them to the School for a meeting to discuss preparatory activities and request them to participate in the Badi Bata Programme to be conducted during June 2018(See above). Therefore, all the District Educational Officers & Ex-DPO, SSA in the State are requested to issue necessary instructions to MEOs/Head Masters in their Districts to initiate above preparatory programmes so as to conduct Prof. Jaya Shankar BadiBata Programme for the Academic year 2018-19. The day wise schedule and programme of BadiBata will be communicated separately(See above file and download it). The District Educational Officers are directed to furnish a detailed report on preparatory programmes and readiness to conduct Badi Bata in their districts without fail.